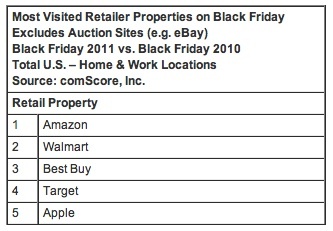 The well-known market research firm comScore today released data on U.S. sales for Black Friday. The report shows that customers spent $816 million, up 26% over last year's numbers. Apple’s online store became the fifth most-visited online retailer in the country on Black Friday behind Amazon, Walmart, Best Buy, and Target. According to research firm Kantar Worldpanel ComTech, demand for Apple’s iPhone 4S helped the company to push it market share in the UK to nearly 43% in October. Apple's U.K. market share increased 2.8 percent to 27.8 percent year-to-year and it is the first time since late 2010 when Apple’s sales beat Android-based handset sales in the region. "Apple took a whopping 42.8 percent share of all smartphone sales, giving it a significant lead over Android - a feat many thought was impossible," said Dominic Sunnebo, global consumer insight director at the firm. About 75 percent of British customers who purchased an iPhone 4S in October already own a previous version of the device, with 14 percent upgrading from last year's iPhone 4. 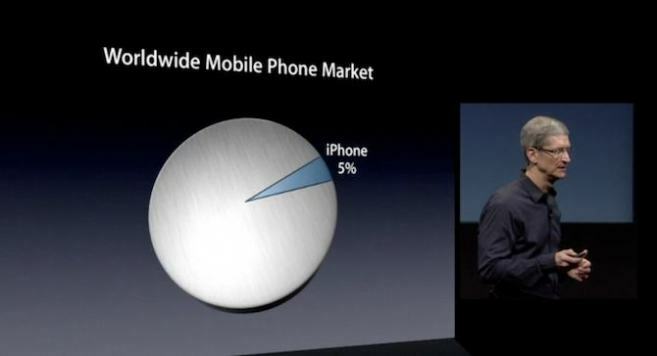 Sunnebo claims that the main driver for the sales of the iPhone 4S in the U.K. was the existing iPhone users. The second driver is rather long period between the launches of the iPhone 4 and 4S. 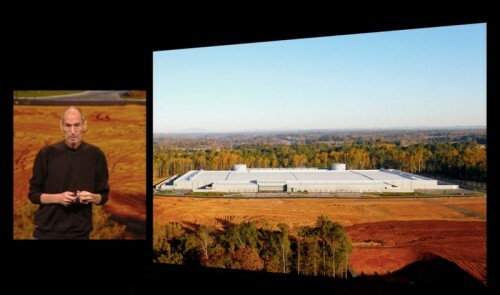 Local residents view Apple's massive data center in Maiden, N.C. as “disappointing development” because it seems not to answer their expectations, bringing just 50 full-time jobs to the area with double-digit unemployment rates. Residents are rather skeptical about Apple’s positive influence on the city, and thinking that the company has done nothing to improve the situation. But, at the least, two residents, Donnie and Kathy Fulbrigh, have benefitted significantly from Apple's venture. Apple paid $1.7 million for their one-acre property. At first they didn’t want to sell their property, but Apple offered them to set their own price, and they finally gave up. As for others, the situation hasn’t changed for them. It still very hard to run a business here. 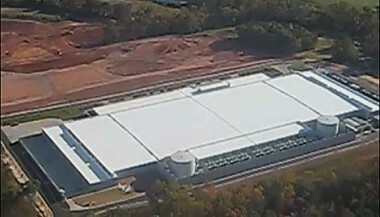 The North Carolina legislature amended its corporate income tax law in order to offer Apple tax breaks of up to $46 million over the next 10 years to build its data center in the state. According to the report, local authorities have discounted property taxes by 50 percent and personal taxes by 85 percent. In exchange, Apple has created 50 full-time jobs and is also expected to create 250 "indirect contracting jobs." According to a new analysis, first time for 15 years Apple’s worldwide share of PC market passed 5 percent up from 4.7 percent in June and 4.4 percent a year ago. Analyst Charlie Wolf of Needham & Co. reported that in the third calendar quarter of 2011 Mac shipments outpaced the PC market for the 22nd straight quarter. Apple’s growth was 24.6 percent, while growth in total PC shipments was 5.3 percent. During this quarter Apple sold 4.89 million Macs, there are the record numbers of Mac sales. "More impressively, the growth in Mac shipments in the past year represented 20% of the growth in worldwide PC shipments," he said. To further put things into perspective, Wolf noted that Apple's September quarter Mac shipments exceeded annual Mac shipments for all years prior to 2006. Mac shipments significantly increased in both the home and business markets. In home market Mac shipments showed 25.6 percent growth, while the overall increase was only 4 percent. Shipments to the business market were an impressive nine times the market pace: 43.8 percent versus 4.8 percent. Wolf suggested that Mac success could be attributed to halo effect from the iPad and iPhone. However, Apple didn’t show great performance in the education and government markets. In the third calendar quarter of 2011 Mac shipments to education customers for the quarter grew on 2.9 percent, compared to 16.9 percent for the PC market. Such situation might be caused by the iPad cannibalization of the education market. Research firm Gartner recently released its estimates of PC sales in Western Europe for the third quarter of 2011. Despite the overall decline of 11.4% for the market, Apple’s sales in Western Europe were up 19.6% year-over-year. In mobile PC market Apple showed the most significant performance of 28%, comparing to the last year performance. 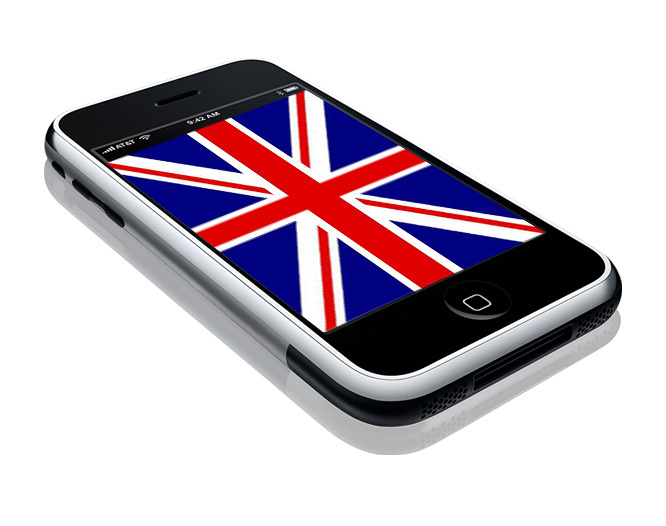 Gartner especially paid attention to the United Kingdom, France, and Germany, noting that in the UK Apple became one of five top vendors. Apple’s sales here increased up to 21.8% year-over-year. So now the company takes the fourth place in the United Kingdom with 7.8% of the market. Apple’s rival Samsung goes slightly behind with 7.3% of the market, despite the fact that Samsung’s growth there was 39%. As for the U.S. PC market, Apple took 12.9% for the third quarter, demonstration significant increase in sales both quarter-over-quarter and year-over-year. Apple cooperates with an American company which helps Apple to build its forthcoming solar farm in North Carolina. Leaf Solar Power, a renewable energy company that specializes in residential and "small" commercial projects in South Florida is working with Apple on construction of Apple’s $1 billion data center, according to a person familiar with the ongoing project. Apple's massive $1 billion data center was opened this spring. The main purpose of the facility is to support Apple's online services, including iTunes and the newly launched iCloud. And use of sustainable energy is not new for the company. As usual for Apple, details of the project have not yet been revealed. We just know that last month Apple received permit to erosion control in the area. This is quite unusual that Apple chose U.S.-based solar company, because now the most part of solar panels is produced overseas. In particular, solar panel production has greatly shifted to China over the last two years. That fact has become such an issue that earlier this year, U.S. President Barack Obama signed a law with a "Buy American" provision for the purchase of solar panels. So may be Apple decided to support President’s idea?! MacBook Air ships with either a moderately fast SSD from Toshiba or a significantly faster drive with an updated controller from Samsung. But some people want to have even faster drives. 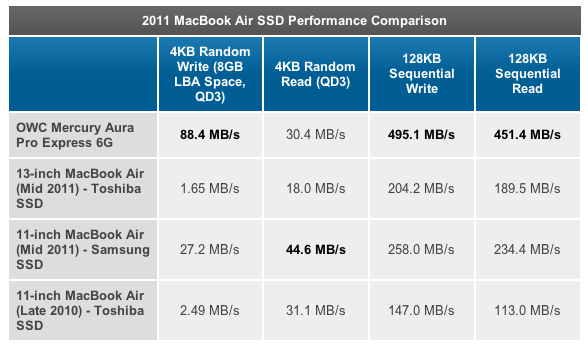 And SSD from OWC called Mercury Aura Pro Express 6G can provide them with faster speeds. 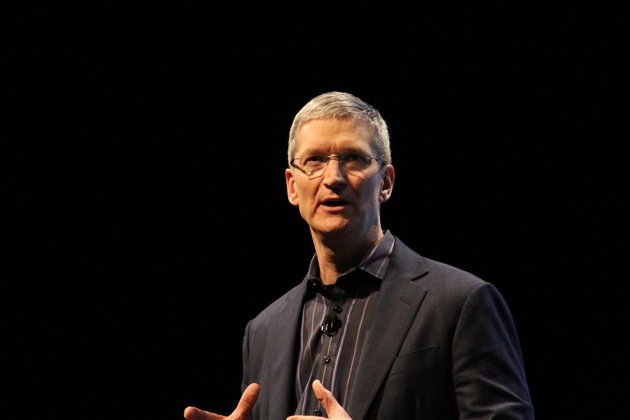 Two months has already gone since the moment when Tim Cook was appointed Apple’s CEO. The Wall Street Journal decided to take a look at his management strategy and found out some differences between his style and that of Steve Jobs. In recent weeks, Mr. Cook has tended to administrative matters that never interested Mr. Jobs, such as promotions and corporate reporting structures, according to people familiar with the matter. The new chief executive, 50 years old, has also been more communicative with employees than his predecessor, sending a variety of company-wide emails while addressing Apple employees as "Team," people close to the company said. Cook made significant changes in Apple’s education division. As a result the division was divided into marketing and sales divisions and then reintegrated with the company's broader arms focused on those aspects of the business. Another corporate-level change is recently-announced charitable matching program that calls for Apple to match employee donations up to $10,000 per year, a change from the Jobs who was reportedly against giving money away. Cook seems to recognize quickly expertise and achievements of his employees, and ready to promote them, such as with the promotion of Eddy Cue. SmartOffice reports that Samsung is requesting Apple to provide them with the source code for the iPhone 4S firmware. Samsung doesn’t abandon their attempt to ban the device in Australia, trying to find any loophole to achieve success. Moreover, Samsung wants to know details of subsidy agreements with all Australian carriers. “It goes to show that since the iPhone 3G was made available in Australia in July 2008, the impact on the market for every iPhone product has been significant, and has lead to a substantial increase … in market share by revenue. If subsidies are given for the iPhone 4S, there are less to go around for my client’s products,” - Samsung counsel Cynthia Cochrane told the federal court. As for the source code Apple denies any infringement. The Company claims that Samsung agreed to license the three wireless 3G-related patents in question under FRAND agreements. Samsung thinks that agreement doesn’t cover Apple in Australia and claims Apple denied previous attempts to extend the license internationally. But it seems that all Samsung’s attempts will be unsuccessful, because the case will be handled by Justice Annabelle Bennett, who handed out the injunction against Samsung’s Tab 10.1. Macotakara reported that Apple is allegedly testing a new thin-and-light 15-inch MacBook to add it to its lineup in the near future. Apple now is finishing up a taste phase. According to Asian source, Apple already finished development of an LCD test component for the new laptop. 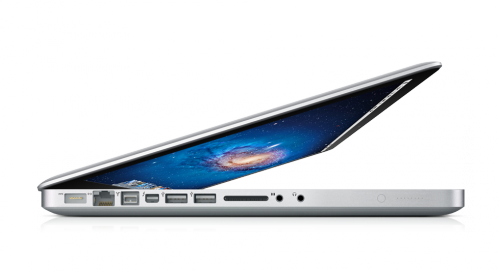 The next Apple’s notebook is believed to be a next-generation MacBook Pro without a built-in optical disc drive. That means that the new notebook will undergo significant changes in design in 2012. Moreover, earlier this year, there were some rumors about drastic redesign of the MacBook Pro line. Last week, ahead of the holiday buying season Apple quietly updated its MacBook Pro models, adding slightly faster Intel Sandy Bridge processors, as well as improved AMD Radeon graphics. 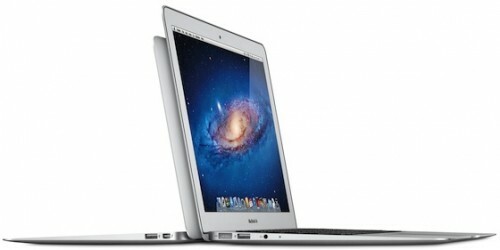 The new MacBook Pro may boast about Intel's next-generation Ivy Bridge processors. Moreover, Intel has already begun production of new processors. Chinese customers prefer to buy Apple’s iPhone than Nokia’s smartphones, according a report published by the investment bank Morgan Stanley. As more than a third of 2,050 surveyed urban Chinese mobile phone users express a preference for iPhone, twice that for Nokia's models. 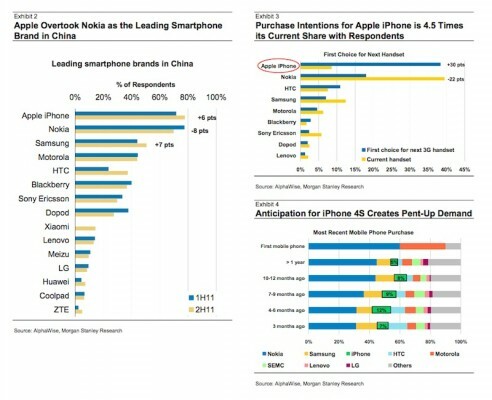 Apple presence on Chinese smartphone market grew significantly in 2011. Not surprisingly that over fiscal 2011 the company managed to earned as many as $13 billion, comparing with $3 billion in fiscal year 2010. 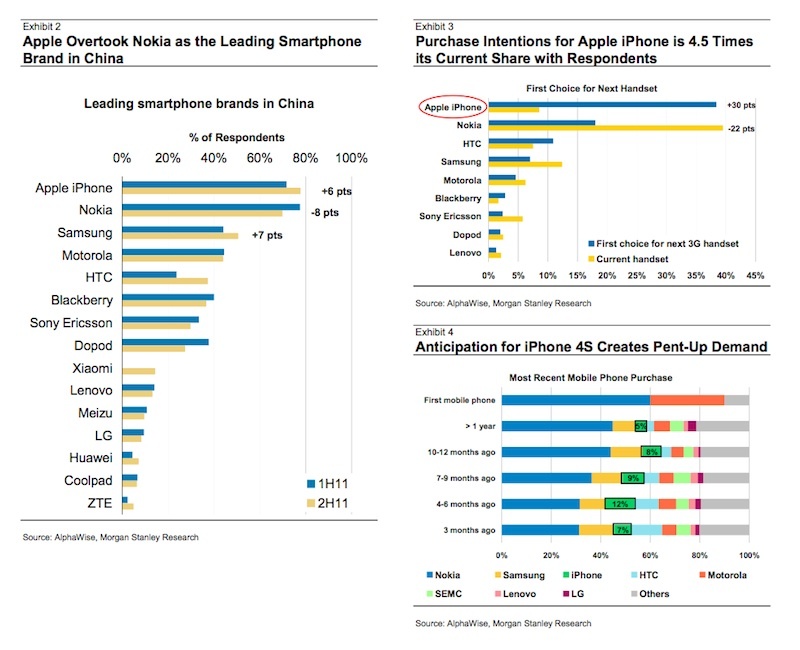 Morgan Stanley says it believes "China could surpass the US as Apple's largest market in about three years, adding nearly $30 billion more per year to the top-line along the way." The firm notes that sales of iPhones are also driving purchases of related Apple products, noting that Mac use is nearly four times higher among iPhone users, where Mac user share jumps to 35 percent from the standard 9 percent of the general population. Morgan Stanley’s survey demonstrates that Apple increased its share by 6 percentage points to reach 34 percent of planned purchases in the region. Nokia dropped 8 percentage points to make up just 16 percent of the nation's planned purchases. In the third quarter of 2011 Samsung gained the lead and China’s ZTE became the fourth-largest cell phone manufacturer moving Apple to fifth place. Cupertino-based company for the first time fell short of expectations and shipped 17.07 million iPhones in the third quarter, a 16 percent quarterly decrease in sales. As you remember, in June quarter Apple sold 20.34 million iPhones, which allowed the company to beat Samsung and Nokia and become the leading smartphone manufacturer in the world. According to Forrester research, Mac business users are more productive than their PC counterparts, because MacBook laptops from Apple tend to be more reliable and require less maintenance than PCs. Forrester issued a new report entitled "People are Bringing Macs to Work - It's Time to Repeal Prohibition" in order to encourage companies to support Apple hardware in the workplace. Although the use of Mac in enterprises is increasing, approximately 41 percent of companies that took part in the research do not officially allow their employees to use Mac. Of course, users find ways how bypass company restrictions and use their Mac at work. Moreover, Mac sales in the enterprise sector have seen a huge spike in 2011. In May, Apple announced that corporate Mac sales grew by 66 percent. But sales of iOS products are more significant. 93 percent of Fortune 500 companies are deploying or testing the iPhone, while 90 percent are doing the same for the iPad.